I am thankful for so many things in my life and I have to say, and being reminded of it is heart rendering. The other day I was having lunch at a health food store/restaurant and a women sitting next to me at the counter, struck up a conversation about reflexology. We got on the subject of my shoulder and arm- (for those of you who have followed my blog for awhile, you know what I'm talking about). Long story short I was feeling a little sorry for myself because of my injury. After we were done talking I turned to my left and there sat next to me a man with a prosthesis for his right arm and hand. We talked for awhile, he was eating a salad, one of the most time consuming meals to eat, even when your hands are normal. He was heading back home to the northeast, where he hoped when he returned he would have electricity. 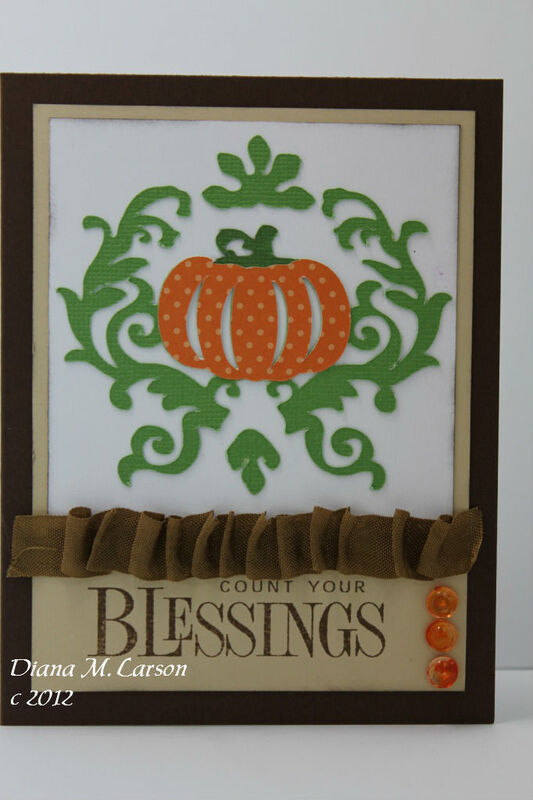 I used The Damask Decor cricut cartridge for the pumpkin and flourish image. All my card stock is PTI. and sunset orange skittles for the three accents on the right. The challenge will begin on November 8th at 9:00 am and end on November 24th at 11:59 pm. Like the cut out look to the pumpkin, the ruffled ribbon & button embellishing. What a beautiful card, Diana. Love the ribbon and the sentement!!! I love your card Diana. Your story is very heartwarming. Sometimes I get so caught up in the moment, that I forget to reflect on all that I am thank ful for. Beautiful card Diana! And your story was good, makes you really stop and think. Thank you for stopping by, life has been quite busy at our house. And I'm sure it's going to get busier now that the holidays are here! Have a great weekend and I want to try and play in your challenge...it's a good one! Diana: Your blog is such a wonderful place for crafters to share their art, and I want you to know that I (and so many others) appreciate you for the lovely job you do to encourage crafters. I just feel SO blessed that you have chosen to link up with us at Word Art Wednesday. It blesses my heart, and I appreciate it immensely. You are such a dear soul, and I pray that God will bless you for blessing others. Thanks for sharing with us in our challenge. Diana, Count your blessings, oh my how different would things be if ONLY we remembered to do this. The little song we sang at Sunday school in the early 1950's is now ringing in my heart. I to had the opportuninty to slip into self pity today however I chose not to. Your card is a beautiful creation. It blessed me. Thank you so much. What a beautiful and loving card!Love your post! !I've learned to give thanks for everything,even for the things that I do not see...Beautiful Post. Thanks for the wonderful reminder to be thankful for what we have. Your card is beautiful! I enjoyed the challenge. Wow, pretty card! I love the pumpkin and the pretty ribbon! The sentiment looks perfect....great card! What a pretty card!! Love the crinkled ribbon accent! Thanks for sharing it with us at Word Art Wednesday. Blessings. Isn't it amazing how people seem to walk into your life and tell you their story just when you need to hear it the most? I have something called Meniere's disease. I get really bad vertigo and sometimes have to stay in bed for days or even weeks. I have vomiting and really bad ringing in my ears. I can't watch TV, I have to lie very still in a dark, cool room....and then it goes away and I am well again. While all of this is going on, my family & friends are in and out of my room visiting me and making sure I am comfortable and waiting on me. Oh I can have a pity party for myself! Oh how blessed I am! Such a pretty card Diana, and thank you for sharing this story with us. We all have our own blessings and it sure is wonderful when HE shows them to us! Have a SUPER day and thanks for the FUN! Thanks for sharing your story with us. Your card is so beautiful!! I just linked my project. Thank you! Yes, there is SO much to be thankful for!